My colleague Alexander Richter and I recently presented an article on ‘Leadership 2.0’ at the Hawaii International Conference on System Sciences (HICSS). The article deals with the impact of social media and online communities on leaders in organizations. We present a framework to support and engage leaders in the transition process towards a networked organization. You can find the abstract, our conference presentation, and the full citation below. Social Media and Knowledge Management: Opportunity or Threat? I’ve acquainted myself with the work of Georg von Krogh when I first dealt with Nonaka and Takeuchi’s (1995) Knowledge Creating Company in a module on Organizational Learning at the University of Nottingham. That is mainly because in 2006, Nonaka, von Krogh, and Voelpel published a review on Knowledge Creation Theory in the journal Organization Studies that I happened to come across while finishing my coursework for the above mentioned module. More recently, Professor von Krogh and his colleagues edited a very interesting issue of the journal Long Range Planning dealing with social software and strategy, which I referred to in an earlier blog post. In his most recent article published in the Journal of Strategic Information Systems, von Krogh deals with the impact of social software on knowledge management. von Krogh states that, on the upside, employees who use social software can do their work more flexibly. In addition, they can take better, more timely local decisions and they can solve tasks and communicate more efficiently. On the downside, the protection of critical knowledge assets becomes increasingly difficult, threatening the overall value of the firm. As a consequence, costs and risks need to be carefully balanced against the potential gains. 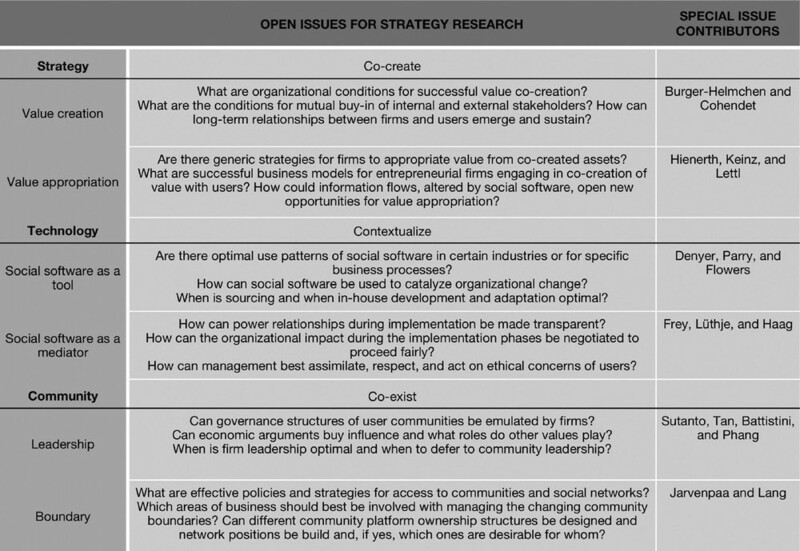 What are the choices and implications of social software for knowledge processes in organizations, and how do these differ from those of traditional knowledge management? What are the barriers and enablers to the adoption of knowledge management by social software in ﬁrms? How does the ﬁrm ensure the value of knowledge when implementing knowledge management by social software? How do ﬁrms balance implementations of knowledge management? What are the consequences of knowledge management by social software for competitive advantage? How do ﬁrms dynamically recreate boundaries? Nonaka, I., von Krogh, G. von, & Voelpel, S. (2006). Organizational Knowledge Creation Theory: Evolutionary Paths and Future Advances. Organization Studies, 27(8), 1179–1208. von Krogh, G. (2012). How does social software change knowledge management? Toward a strategic research agenda. The Journal of Strategic Information Systems. 21(2), 154-164. Posted on July 11, 2012 May 10, 2015 Tags knowledge creation theory, nonaka, social software, takeuchi, von kroghLeave a comment on Social Media and Knowledge Management: Opportunity or Threat? A couple of days ago, I commented on a research framework on social media by Kietzmann and colleagues published in the Journal of Public Affairs. I had another article sitting on my desk which was similar in scope. It’s been written by Haefliger and colleagues and served as the introduction to as special isssue of the journal Longe Range Planning. 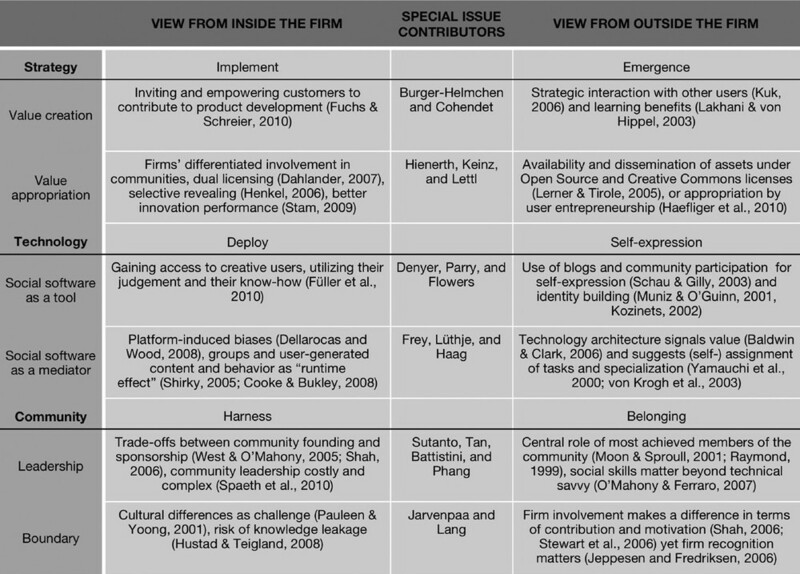 Haefliger and colleagues distinguish between strategy (value creation & value appropriation), technology (technology as a tool vs a mediator), and community (leadership & boundaries). Furthermore, they look at social software use from an internal and an external perspective. I find this structure more appealing and intuitive than the honeycomb presented earlier. A nice additional feature is the research agenda they produce. I’ve included both tables below.